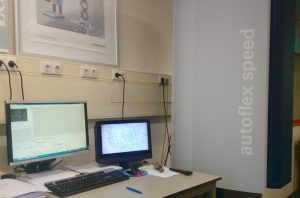 Using the Autoflex equipment from Bruker, the sample of interest, together with a matrix material, is ionized with a laser beam. Usually this proceeds without fragmentation, leaving the molecule of interest intact. Under the influence of an electric field, the charged molecules cross a certain distance during the so-called “time-of-flight” before they hit the detector. The “time-of-flight” depends on the molecular mass, and by measuring it precisely, the mass of the charged molecule is determined. MALDI-TOF-MS analysis allows the analysis of pure compounds, oligomers and polymers with molecular weights up to about 10.000 Daltons. Preferably, lower dispersity (D=Mw/Mn) samples are measured. SyMO-Chem has available a Waters Xevo G2 Quadrupole Time of Flight (Q-TOF MS) equipment that is able to perform accurate mass HRMS measurements (< 5 ppm accuracy). Accordingly, the identity of molecules can be confirmed by measuring their mass. SyMO-Chem offers HPLC analysis with photo-diode array (PDA) detection and electrospray ionization mass spectroscopy (ESI-MS) detection (Thermo LCQ ion trap). 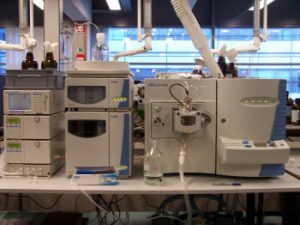 HPLC-PDS/MS can be used to analyse various organic compounds or mixtures (medium polar compounds or compounds with polar groups are easier to measure), peptides, polymers or proteins. The main requirement is that the sample of interest needs to be (de)protonated, and needs to be soluble in acetonitrile/water mixtures at a concentration of about 1 mg/mL. Electrospray ionization is a mild ionization technique that avoids molecular fragmentation. The intact compounds can be detected with MS. In contrast, the HPLC-MS equipment can also be used to analyse (molecular) ions by MS-MS, here one deliberately fragments selected ions. 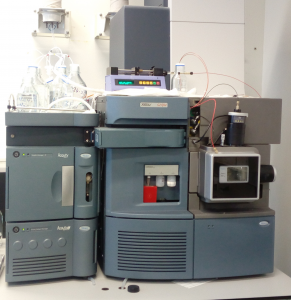 A Shimadzu GC-17A with a Shimadzu GCMS QP5000 detector or a Perkin Elmer Autosystem GC with a FID detector are ideal machines to analyze low molecular weight organic compounds (up to FW ∼500) or mixtures. The purity of a sample can be found out, and thanks to the MS detector, one is able to identify the compounds or impurities in a sample. The equipment can also be used in a direct insertion probe (DIP) mode. Here, the use of the GC capillary column is by -passed, the sample is heated using a temperature gradient, and species are directly analysed by the MS detector. GC measurements can also be performed using a Flame Ionization Detector (FID). In this configuration, there are several capillary columns available, including columns for the analysis of chiral compounds. 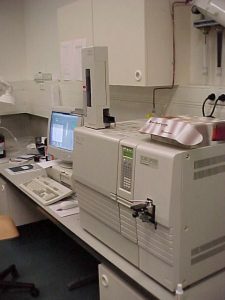 A Shimadzu LC-10AD with a Shimadzu RID 10 and/or a Shimadzu DAD can analyze polymers with molar masses up to 400.000 Daltons using a PLgel 5 μm MIXED-D column (CHCl3 as eluent) and up to 2.000.000 Daltons using PLgel 5 μm MIXED-C and MIXED-D columns in series (THF as eluent). The detection is possible with UV, Photo Diode Array (PDA) and/or with differential refractive index (RI) detection. When required, we can set up and operate SEC using other (organic) eluents, such as DMF, ODCB and aqueous buffers.